• The 2018 Market Leader Profiles report: This 57-page directory (PDF format) provides an overview of each sector, key shifts in 2017, and a snapshot of available company information: four-year revenue trend, key executives, number of locations and employees, and highlights for the year. Free for MDM Premium subscribers! (A $195 value). • Trend analysis: year-round coverage of industry trends, including extensive analysis of the impact of Amazon Business on distribution. • Data reports: Quarterly Pricing Trends Report, Product Consumption Snapshot, MDM-Baird Quarterly Distribution Survey and more. • Company news: Public company financials, market moves and more. • Direct insight from your peers and competitors: Interviews with executives working in and with distribution companies. • Quick to read: Two 12-page issues emailed directly to your inbox each month. • Diverse coverage across sectors: Case studies, M&A deal analysis, surveys and more. • Years of research: 24/7 access to online archives with more than 10 years of best practices and trends in distribution. • Discounts on MDM Store items, including the Economic Benchmarks for Wholesale Distribution, Competitive Landscape report and more. Print subscriptions outside the U.S. are an additional $20. Download the MDM Premium rate sheet. Get MDM Premium for Your Team and Save! Subscribe for a year or more and a colleague at the same company can subscribe for nearly half the annual rate. Use this pre-written letter to explain the value of MDM Premium. Call 888-742-5060 or email info@mdm.com for more information about MDM Premium. “Trends and writing are always on the mark. “In addition to keeping to keeping me up-to-date on industry announcements and trends, every issue has at least one insight that can help our company grow and be more profitable." “I’m a small distributor and don’t have the geographical exposure that larger companies have. MDM tells me what’s going on in the distribution business aside from my local market. When you subscribe to MDM Premium, you get full access to mdm.com and two new issues of all-original content each month. 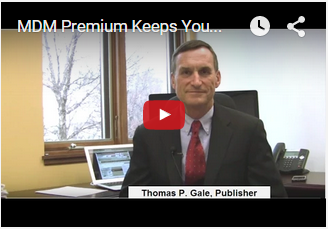 A subscription to MDM Premium is risk-free. If you are not 100% satisfied, we’ll refund every dime. What makes MDM Premium different? You’ll benefit no matter what sector of distribution you are in. MDM editors provide in-depth distribution industry trend analysis across sectors. You’ll read best practices in management, sales and strategy, as well as analysis of distribution and manufacturing mergers and acquisitions and what they mean for independent distribution channels. Our focus is on the challenges and opportunities facing the executives of any wholesale distribution company or any company selling through or to wholesale distribution. Find out why distributors say that MDM Premium provides the “most thorough and timely analysis of our industry” in a “quick-to-read” format. Subscribe today. Doug Savage, President and CEO, Bearing Service Inc.